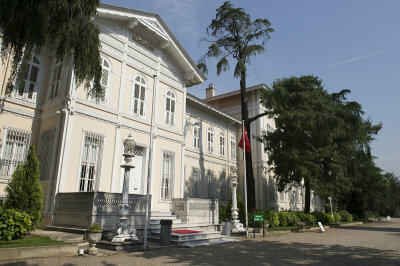 The sultan’s residence was in the Şale Kiosk or pavilion. The building has two floors and a basement and constructed from a mix of wood and stone. It was constructed in three phases. The first part was built in the 1870s and was designed to resemble a Swiss chalet, hence the name Şale. Winston Churchill and Charles de Gaulle were among the visitors to this part of the palace. The second section was added in 1889 to accommodate Kaiser Wilhelm II, who was the first foreign monarch to visit Constantinople. It was during this phase that the Sedefli Salon (Mother-of-Pearl Salon) was added. The name derives from the extensive use of mother-of-pearl that covered almost all of its surfaces. There are also detailed painted landscapes on the ceiling. The third section was also built for Kaiser Wilhelm II in 1898. The reception chamber was built during this period and remains the most impressive room in the entire Şale Pavilion. There is a single carpet on the floor that has an area greater than 400 square meters and was hand woven by 60 weavers. Elegant features of the chamber include a gilded, coffered ceiling and large mirrors. Abdülhamid II was a skilled carpenter and actually made some of the pieces of furniture that can be found in the Şale Pavilion.